Where Movies Still Matter! We feature First Run films and old favorites. 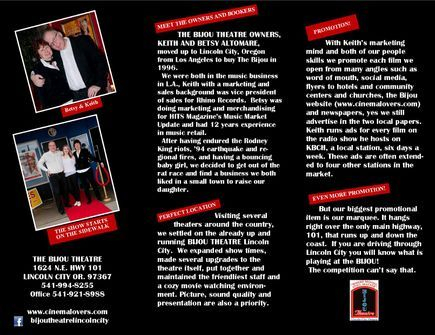 The Bijou was erected in 1937 as the "Lakeside Theatre" to serve the needs of a growing community by providing entertainment. 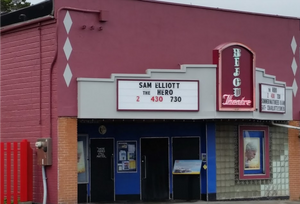 With first run movies, timeless classics and matinees every day of the year, the Bijou has truly been a place where movies still matter and many have come to escape reality and daydream, envision the future, or to re-visit the past. Couples have broken up, made up, and fallen in love under the bathe of the light of our silver screen. 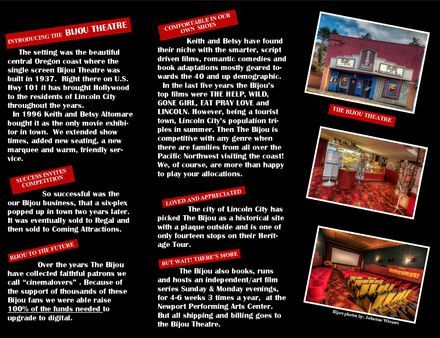 They have fought crime, solved the mystery and sometimes they’ve become the bad guy... Our promise to you is that the Bijou will always be the place where you can enjoy the best of film, while the magic of movies takes you away! Now Fully Digital thanks to donations from Bijou cinemalovers! In 2017 we renovated the marquee, painted inside and out and installed new, comfy seats in the auditorium! Lots of leg-room! We’ll see you at your Bijou! Keith & Betsy Altomare .